Bold items within the Action column represent menu/selection text. Trial Name M Trial that this plate is associated with. Upon selecting an exisiting trial, this will display the relevant plates to this trial. 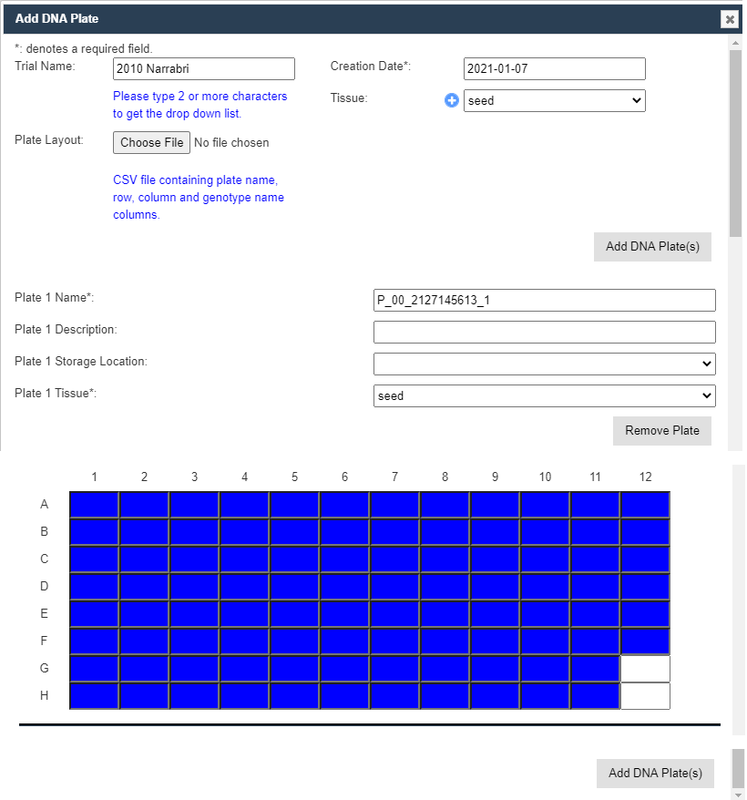 Plate layout CSV file containing plate name, row, column and genotype name columns. Plates as in the following illustration may be removed using the Remove Plate button at the bottom left. Also individual cells may be edited or removed as required. Selecting a Well will display the Edit Well Plate window, as displayed in the following illustration, where the well may be Edited or Removed using the buttons on the window. Note: Hovering the mouse above a well will display the Trial Unit Position and the Specimen Name. Selected plates M Plates from DNA Management selected for this Marker Data. 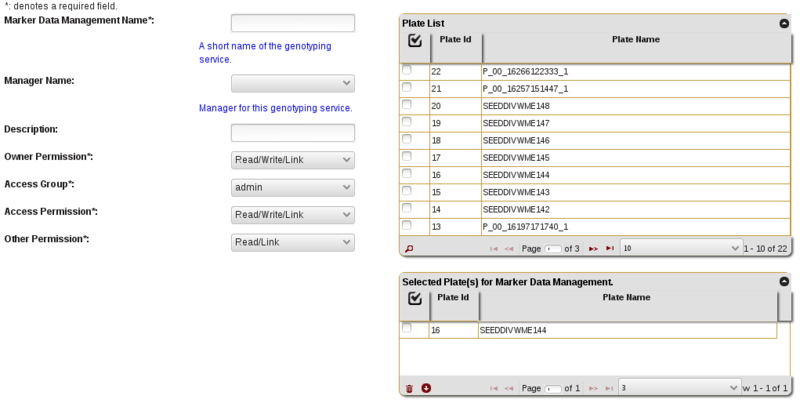 Drag and drop plates from the “Plate List” table to add specific plates to this Marker Data. To upload a new dataset to a Marker Data Management Group, select the Upload dataset button in the Actions column for the required Group. For referencing the CSV file contents, column and row numbering commences with zero. 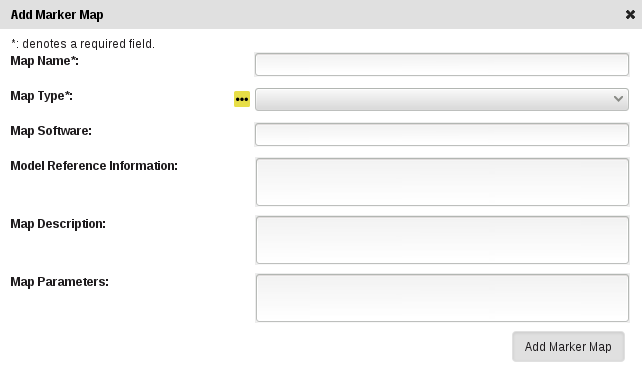 After selecting a file to upload, the file contents will be displayed underneath the form. This can be used to refer to the correct columns as required. CSV Data Set File Browse to locate and select the appropriate CSV file for import. Plate Name Row The row where that the contains the plate names. Well Position Row The row where that the contains the well positions. Header Row The row where that the contains the headers. Marker Name Column The column where that the contains the marker names. Sequence Column The column where that the contains the sequences. Meta Data Start Column The first column in the CSV file containing meta data for import. Meta Data End Column The last column in the CSV file containing meta data for import. Data Start Column The first column in the CSV file containing data for import. Data End Column The end column in the CSV file containing data for import. Data Set Type The type of dataset, as defined in Type definitions. To download a set of barcodes for the Marker Data Management group, select the Print barcode button in the Actions column for the required Group. To list all datasets in a Group, select the List datasets button in the Actions column for the required Group. To Visualise a dataset with a heatmap, select the Visualise dataset button in the Actions column for the required Marker dataset of a Group. Data can be further filtered and sorted to retrieve more specific data. Visualised data can also be downloaded as an SVG file for further use. 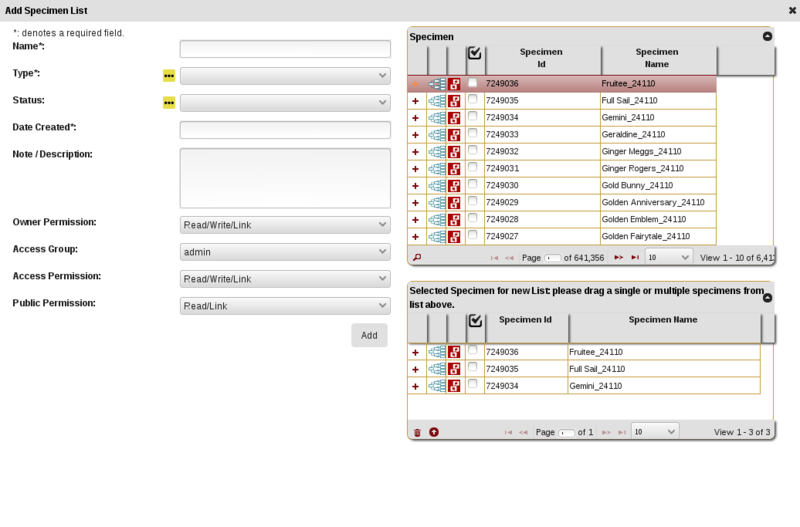 To download, select the Visualise dataset button in the Actions column for the required zMarker dataset of a Group. Format Type The format of the dataset will be downloaded in. In standard installations, this will either be CSV or Flapjack. Extra formats can be added with extra development. Marker Meta Data Field List Chosen marker meta data fields to include in download. Leave blank to include all. List of DNA Extracts Chosen DNA Extracts to include in download. Leave blank to include all. List of Marker Chosen markers to include in download. Leave blank to include all. Data can be further filtered and sorted to retrieve more specific data. Map type M The type of Marker Map, as defined in Type definitions. To add a new Marker Map Position, select the Import Marker Map Position button . Marker Map Position File Browse to locate and select the appropriate CSV file for import. Marker Name Column The column where that contains the Marker Names. Note: markers must match the ones contained in the selected Analysis group. Analysis Group The Analysis group associated with uploaded Marker Map Positions. Note: Analysis group must have a least one dataset.